Using a series of X-ray beams, a CT scanner creates cross-sectional images of the body. 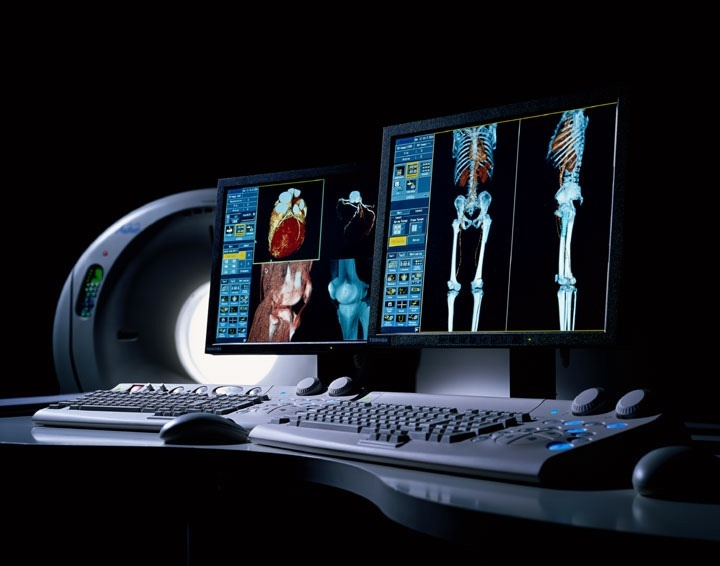 Using a series of X-ray beams, a CT scanner creates cross-sectional images of the body. A computer then reconstructs these “slices” to produce a 3-D image. The result is a picture with greater detail than traditional X-rays. How should I prepare for a CAT scan? CT Abdomen and/or CT Pelvis – You must come in to pick up a prep kit at least two days before your exam date. On the day of your exam, wear comfortable, loose-fitting clothing. Avoid clothing with zippers and snaps as metal objects can affect the image. Depending on the part of the body that is being scanned, you may also be asked to remove hair pins, jewelry, eyeglasses, hearing aids and any dentures. You may be asked not to eat or drink anything for one or more hours before the exam. Women should inform their doctor or x-ray tech if there is any possibility that they are pregnant. Plan on being with us for a minimum of 30 minutes, depending on the part of the body being scanned. The technologist positions you on the CT table and pillows are used to help keep you still and in the proper position during the scan. The table will move slowly into the CT scanner opening. Depending on the area of the body being examined, the increments of movement may be very small and almost undetectable, or large enough to feel the motion. Any allergies, especially to medications or iodine. Whether you have a history of diabetes, asthma, kidney problems, heart or thyroid conditions. These conditions may indicate a higher risk of reaction to the contrast material or potential problems eliminating the material from the patient’s system after the exam. You will be alone in the room during your scan, however, your technologist can see, hear and speak with you at all times. To determine if more images are needed, you may be asked to wait until the images are reviewed. Mouth – You may be asked to swallow water or contrast material, a liquid that allows the radiologist to better see the stomach, small bowel and colon. Some patients find the taste of the contrast material slightly unpleasant, but tolerable. Enema – For a study of the colon, your exam may require the administration of the contrast material by enema. You will experience a sense of abdominal fullness and may feel an increasing need to expel the liquid. The discomfort is generally mild. IV injection – To accentuate the appearance between normal and abnormal tissue in organs like the liver and spleen and to better define the blood vessels and kidneys, a contrast material is commonly injected into a vein. Flushed or have a metallic taste in your mouth. These are common reactions which disappear in a minute or two. A mild itching sensation. If the itching persists or is accompanied by hives, it can be easily treated with medication. In very rare cases, you may experience shortness of breath or swelling in the throat or other parts of the body. These can be indications of a more serious reaction to the contrast material. Your technologist should be notified immediately.